Go to the PLAY/EDIT screen. Toggle the Playback Settings Panel. The first option you'll see is the Playback Mode setting, which allows you to change how you want to flash your lesson slides. To change these settings, simply click on the dropdown list and pick one of the five Playback Modes. 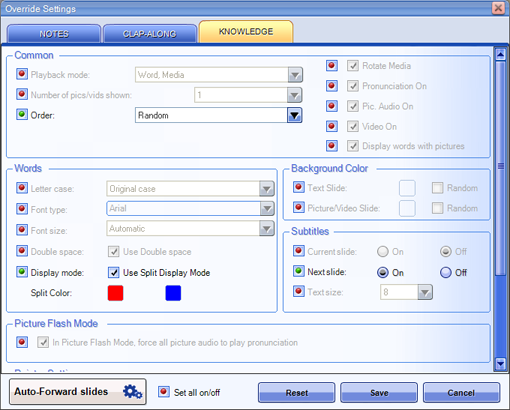 If you select the "Picture Only" mode, you will see a special option to make Little Musician play only the pronunciation recordings when the pictures are flashed during playback. If you choose to play media, you can further specify if you want to turn pronunciations, picture audio and videos ON or OFF. You can also choose to make Little Musician display the words below each picture or video shown during playback. Rotating media files can especially help your child understand the meaning of each word by letting her see or hear a different picture, video, or sound every time you play your lesson. Directly after the Playback Mode option is the Number of Pics/Vids Shown option, which lets you choose how many pictures or videos are shown for each word when you play your lesson. This option is particularly useful if you want to emphasize the meaning of the word by showing different images of the same thing one after the other. Next is the Order option, where you can choose to either flash words according to how these are listed in your category or if you want to flash words randomly. In the Words section, you can set how the words are displayed during playback, from the letter case to the font type, size and color. This is also where you can turn the Double Space option ON, which will help Little Musician display two or more words a bit farther apart to help your child distinguish each word in a phrase or sentence. Another special playback option is the Split Mode, which will display words in two different colors to emphasize each syllable as part of a word. If you want to flash pictures randomly while pronouncing the words yourself, just turn Subtitles ON so you'll know what's coming next ahead of your child. If you want to have all your lesson slides flash automatically without having to click on your mouse or keyboard, just turn the Auto Forward function ON. This way you can use both of your hands to interact with your baby during each lesson! Another special setting is the Pointer option, which will enable a big pointer that automatically moves to show the reading direction to your child. Now you can easily guide your child and at the same time emphasize the direction of reading! Now that you know how to customize the playback settings, the next thing you want to do is know how to apply the same settings to all your Knowledge lessons. 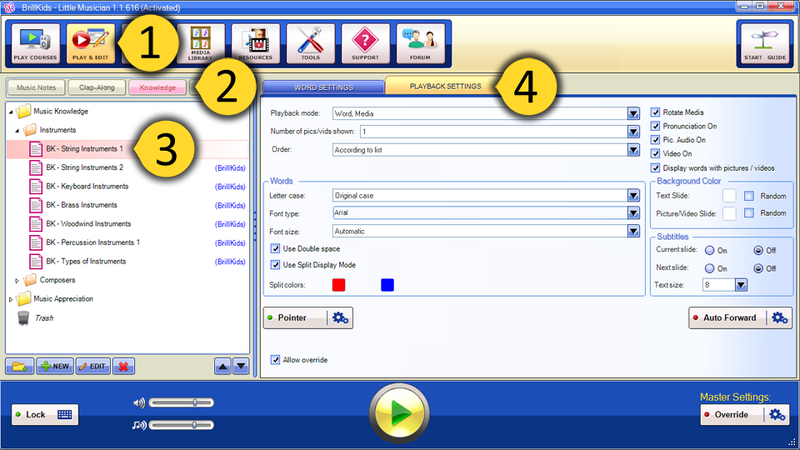 With the Override and multiple edit functions, this seemingly impossible task can be done in just a few steps! Turn the Override function ON by clicking on the Override button so that the light turns green. Next, click on the cog button beside it, so you can set your global playback settings. Inside the Override settings window, select the Knowledge tab. In this tab, you'll find the exact same settings options as the playback settings window we have previously mentioned. Click on the red lights so it will turn green and you will be able to change the global setting for that specific option. You can always turn Override OFF by clicking on the Override button again. On the other hand, if you want to change your playback settings permanently for a certain group of lessons, simply select all the lessons you want to customize from your Lesson Panel. Notice that on the right side of the screen an Edit button will appear. 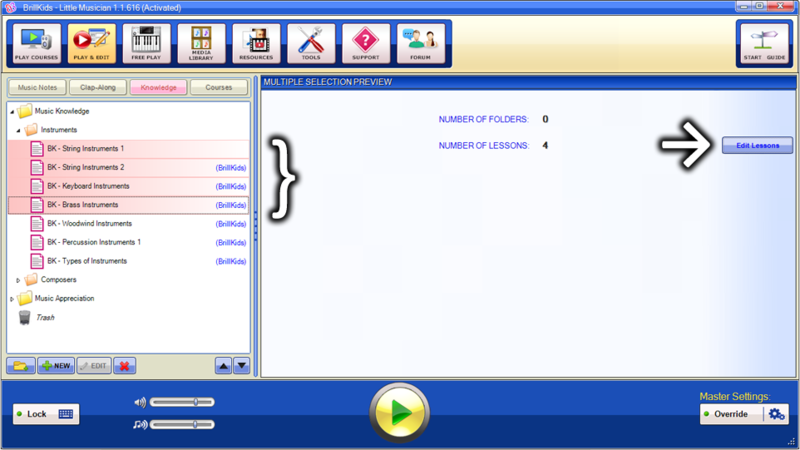 Click on this button and a window will open, and this is where you can set how your selected lessons will be played back. And that's basically how simple it is to customize your Little Musician Knowledge lessons. Give it a try today, and see how it makes your child's Little Musician Knowledge lessons even more exciting!